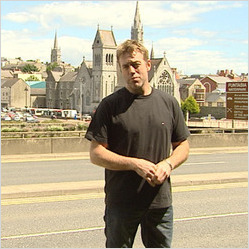 In this brand new three part season 2 of Ireland’s Crime Capitals, reporters Donal MacIntyre and Nicola Tallant travel to various parts of the country looking at a new wave of crime. In the first episode Donal studies the continued presence of the IRA along the border, as well as the road bandits making life hell for Monaghan petrol garages. He interviews the parents of Paul Quinn about his savage murder, widely suspected to have been carried out by dissident Republicans. He also speaks to two girls who were brutally assaulted in a forest near Drogheda. Meanwhile, in the second and third episodes, Sunday World reporter Nicola Tallant investigates the rising number of burglaries across Ireland and uncovers the vulnerability of the Cork coastline as a smuggling route for drugs. She speaks to numerous locals in Goleen about the infamous Dunlough Bay drug seizure while in Cork City she talks to heroin users about the scale of the problem. In Dublin she meets numerous victims of burglaries and hears how thieves are disguising themselves as gardaí to break into homes. In this episode we investigate the continuing role of the IRA along the border. We hear how border hoppers are stealing thousands of gallons of petrol from garages in Monaghan, and we speak to victims about the rising number of racially motivated attacks in Louth.